Oracle Project Management is a solution provided by Oracle for maintaining control and visibility of all aspects of the projects. It is a combination of modern project execution tools and methods that can be adopted by project managers to deploy with existing solutions. In today’s highly competitive global economy, there’s a lot depending on project management for companies. According to various studies, 20 percent of projects fail as organizations take on more risk in search of higher rewards. Therefore, organizations are turning to modern project management solutions like Oracle Project Management. This increases the need for trained and certified project management professionals who can use the platform effectively to get centralized accounting and visibility into performance and profitability. Oracle Project Management Certification validates your skills to track and manage a project through the project lifecycle, from creating and planning, through to completion. An Oracle project manager is responsible for tasks, like creating, managing and viewing workplans, linking Microsoft Project with Oracle Projects, creating budgets and forecasts, tracking and monitoring the performance of a project, managing various issues, etc. Thus, it is important for you to take relevant training to build your skills and boost your confidence to be ready for the exam. According to Indeed.com, an Oracle project manager in the United States earns approximately $96,259 per year. Oracle Project Management Certification opens doors to some of the highest paying positions such as technical program manager and implementation manager. Oracle E-Business Suite (EBS) is a web-based product that can be managed from a single site. It allows businesses to operate a single data center with a single database. 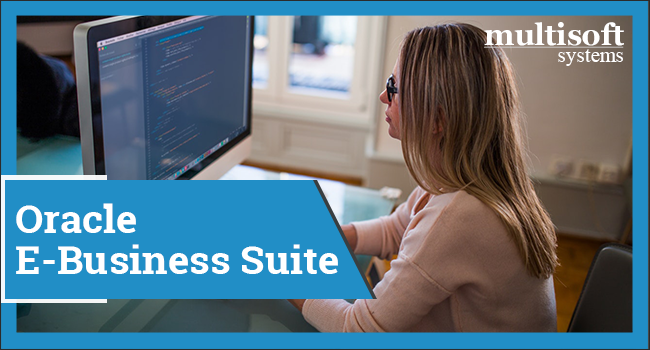 The suite contains a number of product lines, like enterprise resource planning (ERP), supply chain management (SCM) and customer relationship management (CRM) products, which users can implement into their own businesses,. Oracle CRM, Oracle Financials, Oracle Human Resource Management System (HRMS), Oracle Logistics, Oracle Supply Chain Applications, Oracle Order Management, Oracle Transportation Management, and Oracle Warehouse Management System are the applications found in the Oracle EBS that cover the wide range of business processes that are found in any company. Abbott Laboratories, Abercrombie & Fitch, Adventist Health System, Cox Automotive, and Fox Entertainment Group are few of the companies currently using Oracle EBS. Oracle EBS Project Management leads to better decision making, increased efficiency and reduced operational cost. An Oracle certified project manager ensures smooth functioning right from the assessment to the completion of the project. Oracle E-Business Suite Project Management Training and Certification is designed to impart skills required to oversee your full project life cycle with a solution that supports multiple languages, currencies and business units. It not only makes you gain an edge in the market but also adds another layer of hands-on expertise to your project management skill set. Multisoft Systems is an established training organization that conducts numerous Oracle EBS Project Management Training programs. They provide the best training programs in the market to help you prepare and address knowledge areas that might need more attention.